Ok, I am so excited because I'm finally seeing the end in sight for our little craft/exercise room! It's been so cluttered and junked up for too long and I've slowly been chipping away at it. For two years. Last year I worked on reducing the amount of stuff I had. There are still a few things I'm holding onto that I probably shouldn't have but I have a whole lot less than I did! Even after that, I'm still having a storage issue. That has been the main hindrance to making this room organized and functional. I've figured out a furniture layout that I think will work. I'd love to have a small table to work at in this room but, unless I find a great deal at a thrift store this year, the table will have to wait. So right now I'm focusing on creating that storage I need that's functional but looks nice too. I'm planning on hanging shelves on one wall and I wanted to get the painting out of the way before doing that. Usually it takes me forever to decide on a paint color but this time it took me one day. I'm usually up nights thinking about colors for weeks and asking Hubby's opinion every two seconds on three shades of gray-white that he can't tell the difference between. Not this time. I'm so proud of myself. Since we repainted the living room last year(an ordeal I have yet to blog about, now that I think about it), I have like 20 different shades of leftover paint samples sitting in my laundry nook. I started out thinking I wanted a chalky white but then I just started feeling like this room needed a softer, warmer look. This room is an east facing room with no shade so it gets a good amount of light all day long too. I had a few shades in mind before I tried them out on the walls. 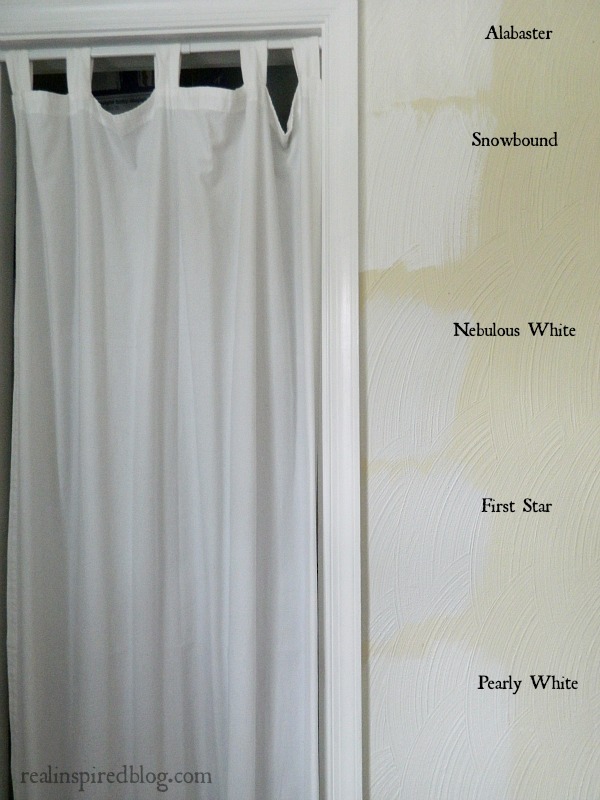 I ended up trying five Sherwin Williams paint colors: Alabaster, Snowbound, First Star, Nebulous White, and Pearly White. Can you spot the shade differences? 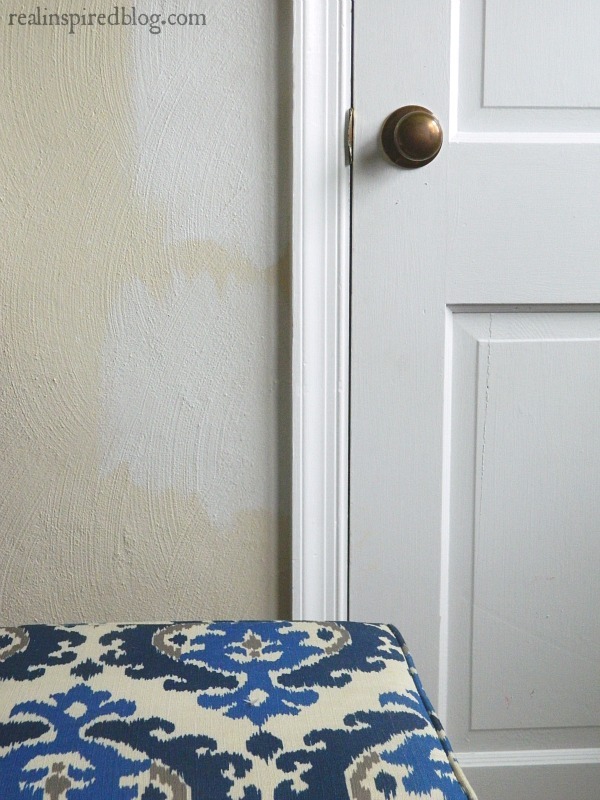 Alabaster is a creamy white that takes on a yellow hue in my east facing rooms. I already have it in my living room and I'm not a fan. Snowbound is the color currently in my kitchen. It's a clean white with no undertone but it looks too bright in this room with all the natural light. Nebulous White has a blue-gray undertone and looks too cool and, while I love First Star, it's a little too gray for what I wanted in this room(in real life it looks much grayer than in the picture). My favorite is Pearly White. Pearly White has a soft, warm gray undertone. If it was on all walls and trim, it would all look plain white but I'm planning on keeping a bright white on the trim so that the walls read as a very light color. 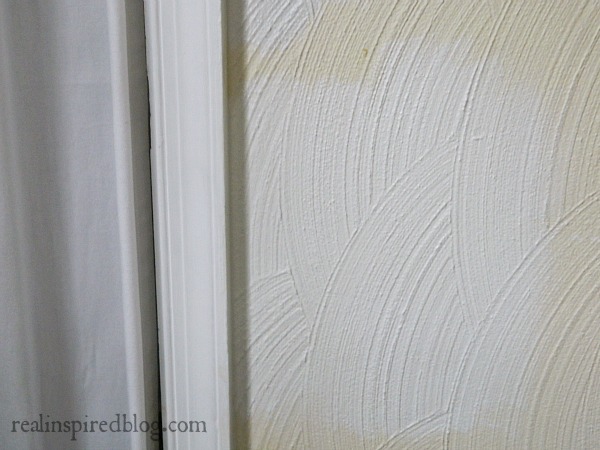 Since this is going to be my crafting room, I wanted a neutral color with very little undertone so I would have a clean backdrop for pictures and projects. Color really impacts how the light looks in photos and I want to avoid tinted pictures as much as possible! The bottom color is Pearly White. Above it is Snowbound. I know, it's white. Everyone seems to be doing white right now and I realize that many people will always like color. I've always loved neutrals though. Even as a teen, my room had really light brown walls with darker brown trim and lots of white and pastel pink. Much to my sister's chagrin, who, after I moved out, promptly painted the room an intense shade of green and white with bright pink and dark brown trim. Her room looked way better than it sounds, I promise! Anyway, no matter how the trends go, I believe that light neutrals will always be my go-to colors of choice. I'll just have to make up for it with my colorful personality, I suppose;) If you really know me, you know that there's a whole lot of snarky cynicism under this outer layer of quiet observation! So, I know from pictures it can be hard to see undertones and color variations but I'd like to know: what is your favorite color from the ones I picked? What is your take on neutrals vs. colors? Which do you prefer?